TSE Tired of doing mundane tasks? What if you had a way to automate tasks to make your job easier and increase your sales? 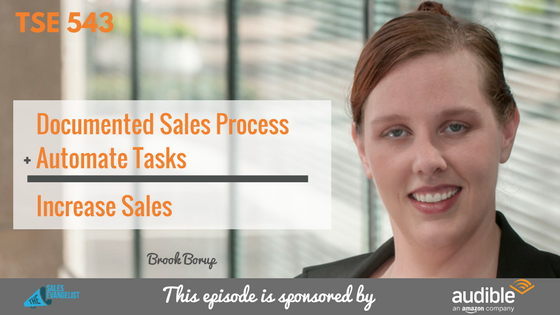 Today’s guest is Brook Borup and she shares with us some ways to automate some of the mundane tasks in your business or your life in general, to make your life much easier and achieve success faster. Brook is the owner of My Clone Solution, a company that helps business professionals and business owners learn to automate and delegate certain tasks so they can focus more on business development. Make sure the first thing you do is have a plan. Have written down processes for your sales plan or projects. Then you can look at that plan and figure out which pieces of the plan you can automate. Figure out where your targets are going to come from. Figure out how you’re going to get your list or how you’re going to contact people (email, phone, in-person). Where are these people coming from? Start with that question and work all the way through your sales process. Try using voice mail as your first touch point but use a system that automatically puts that voicemail in for you so you’re not doing it. This gives you more dial time. Schedule appointments right in your email. Acuity (Paid) – Aside from scheduling, this software allows you to add products in so instead of building an entire online shopping cart, you can have products that you can just send somebody a direct link to. It can also charge somebody for an appointment so they pay for that appointment before they even get on your calendar. All touch points can be automated in a text message, an email, a phone call, or delegated to an admin. Either delegate it to software or people. Put the right people and software in place. Make sure you put the right people and software in to make sure your system flows. So now you’ve taken your 10-step sales process into just 4 steps. Put the time up-front to automate each touch point. The attention span of your client is nine seconds.for each touch point. Make sure that if your sales process doesn’t include an email or text marketing campaign, all touch points should be automated. It takes a lot of work and time but once the work is done, all of the stuff that comes after that is all automated. You touch where you need to when you see your stats where the person is opening every single email. For instance, somebody gets to email #3 and they’ve opened all three emails and are about to go into email #4, now is time for a phone call. So you have a daily task list and you know where those clients are in your sales process. There are so many tools you can use to remind you just by documenting your process. Find an ally in your business. Find this salesperson and build this process out with them. Utilize their knowledge and utilize them to build your process. Have a company that has a specialist for everything so you can solve everybody’s problem with one project manager. Scale your business through packages. Come up with packages and put a dollar figure on them so you can put on a whole big marketing strategy and expand your business development opportunities. Then you can just do the same for every single client because it all happens the same way, just different verbiage. Don’t think you have to do it all by yourself. Find an ally in your business. Find your yin to your yang and keep them around. Find your partner. Utilize your skills because you don’t have to have everything. Connect with Brook on www.MyCloneSolution.com and on Twitter @myclonesolution or Facebook.